Having difficulty decorating a bathroom? IdeaStix offers a unique solution in giving a custom look to showers, tubs and sink areas with removable, reusable and washable features. Choose from a wide selection of designs in a variety of product lines that are heat, steam and water-resistant. 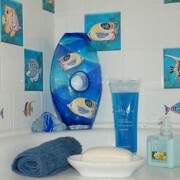 Suitable Products are: IdeaStix Murals, IS Accents, SwitchStix, TileStix, DesignStix and PrintStix Ultra.